Provided the ship has enough provision, water and fuel, everybody loves time at Anchorage. We all love having the opportunity for a breather from the continuous cycle of loading, unloading and everything in between. Even the environment on the wheelhouse is bit relaxed while the ship is at anchor. But it is not unusual that the wind speed would start to increase, or for a nearby ship to drag her anchor or even own ship start to drag anchor. The relaxed environment might become hair-raising, unexciting and spine chilling. So let us face it. Keeping an anchor watch is only easy until everything is fine and the anchor is holding. But that is not true if you know the signs to looks for to determine if the anchor is dragging. Early detection of the dragging anchor situation can save a lot of trouble. In this post, I will discuss the indications to look for to get an early warning of the ship dragging its anchor. The first thing that we need to know for keeping a good anchor watch is the position of the anchor. And there is only one way to know this position. By noting down the position of the ship when the anchor is dropped. In the case of anchoring in deeper waters where anchor will be lowered with gear, it is the position of the ship when the anchor touches the sea bed. It is the duty of the officer on watch during anchoring to note down this position. It is good practice to note down this position along with the time of “let go anchor” in the movement book. 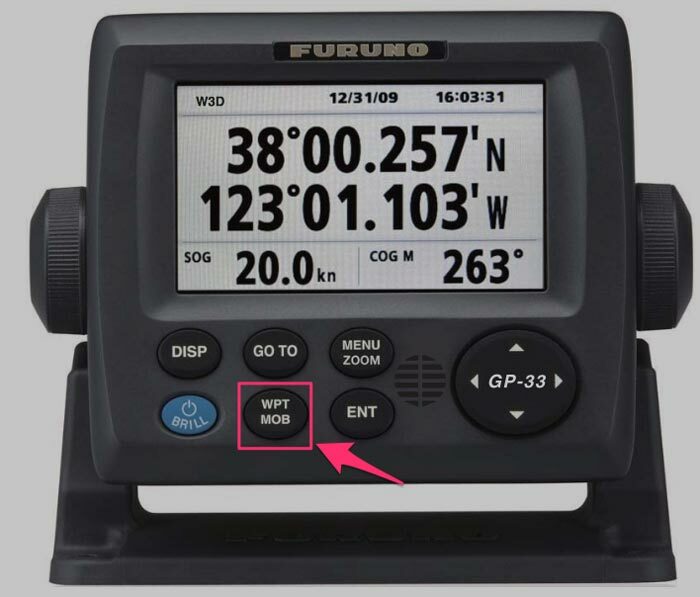 Another thing that we need to do is press the MOB button on the GPS when the anchor is dropped. This will automatically save the position at the time of pressing the MOB button (anchored time). Usually, this position is saved as WP 999. Once we have the anchor position, we need to know the swinging circle of the ship while the ship will be at anchor. This is important because no matter in which direction the ship swings, it will never go out of the swinging circle if the anchor is holding. If the ship goes out of the swinging circle, the ship’s anchor is dragging. Compare this with a cow tethered to a post. The cow can only swing on a circle with radius equal to the length of the rope she is tied to. She can only go out of this circle when the rope has left the post. 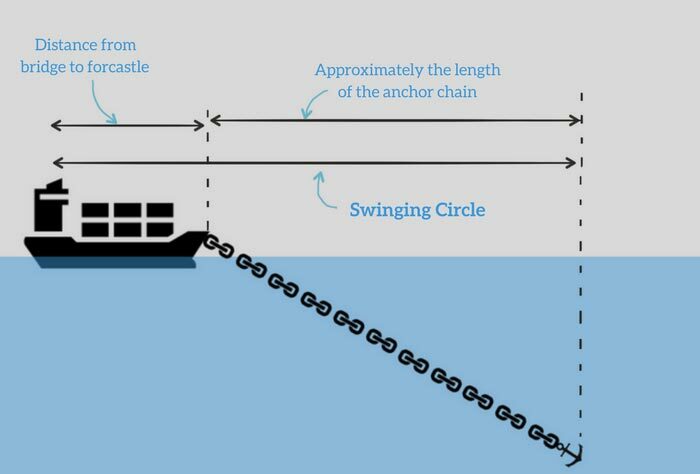 This is the approximate swinging circle as the 2nd distance is not exactly the length of the anchor chain. But believe me, you do not want to be accurate to a couple of meters as you won’t be able to measure the movement of your ship to that accuracy. 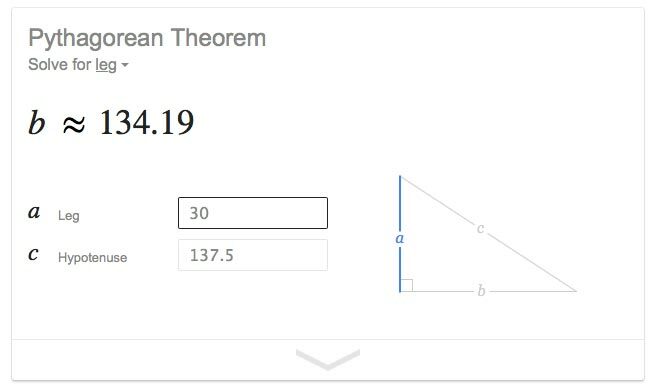 For example, considering a ship anchored in a depth of 30 meters with 5 shackles on deck, the error in the swinging circle (with the simple formula above) will be only 3 meters. So now let us take an example to calculate swinging circle of the ship. Let us say the distance from bridge wing to the forecastle is 150 meters. The ship is anchored with 5 shackles on deck. This gives us swinging circle of 287.5 meters. Now we want this to be in nautical miles. So divide this value by 1852 (1 Nautical mile = 1852 meters). This gives us the swinging circle of 0.155 NM. I often ask this question on board to the duty officers. How would you know if the anchor is dragging? And I often hear this answer, if the bearings (and range) of the fixed object changes, this would mean that we are dragging anchor. While there is no doubt that this is one of the ways but this is not the answer I look for. Duty officer would usually check the bearings once every hour. 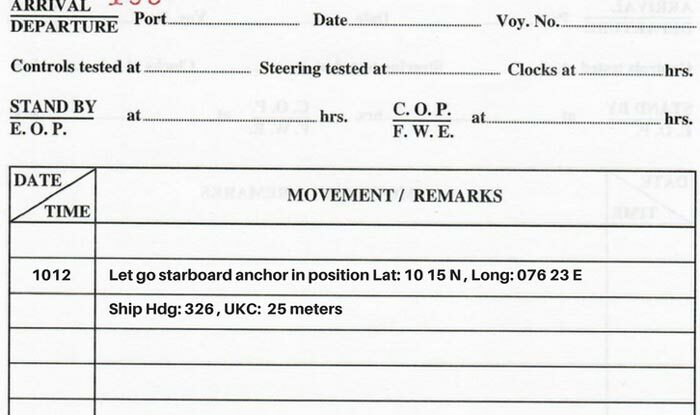 So if anchor starts to drag at 2010 Hrs LT, the duty officer would only know about the dragging anchor at 2100 hrs LT when he would check the bearings. We all want something to nudge us just when anchor starts to drag. An alarm is the best way to get nudged. So when I ask the duty officer, “How would you know if the anchor is dragging?”, I expect to hear this. I will be warned by the anchor alarm that I have set and then I will confirm with the bearing of the fixed objects if the anchor is really dragging. Having an alarm warn you if the ship goes out of the swinging circle is good. But we must know how and where to set that alarm. The anchor alarm needs to be set in the GPS. To set the alarm, first, we need to press “GO TO” on the GPS and then choose the waypoint 999 that we had created by pressing the MOB button at the time of dropping the anchor. This will give us the ship’s distance (Range) from the anchored position. If this range becomes more than the swinging circle of the ship, the ship’s anchor may be dragging as then the ship is out of the swinging circle. 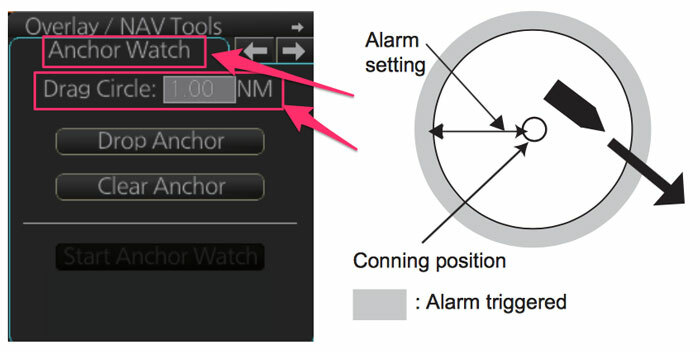 To do that we can go to the alarm settings on the GPS, turn on the anchor alarm and set the alarm range. While setting up the anchor alarm may seem simple (which surely it is), we sometimes make simple mistakes in this. I do not want to list here the mistakes like alarm volume being too low etc. What I want to highlight is to test the alarm. So if the actual range (to WP 999) is 0.13 NM, we should first set the alarm to less than this value (Say 0.09NM) and then see if the alarm sounds. If it sounds, everything is alright. We can then change the alarm range to the actual swinging circle we have calculated after anchoring. 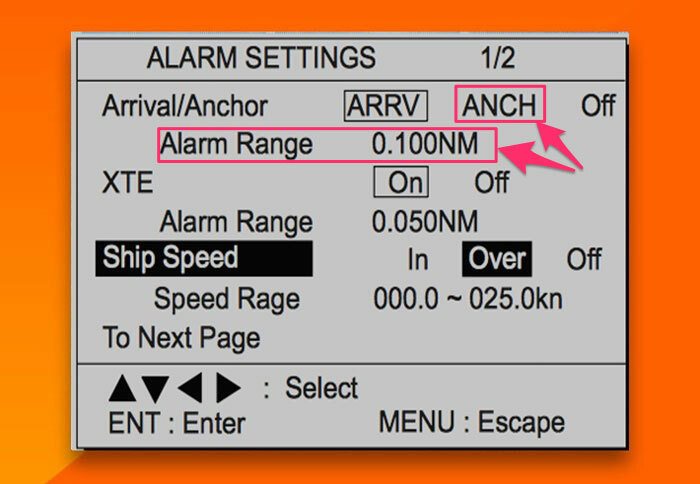 Another mistake I often see officers making is to set the anchor watch on ECDIS without testing it. 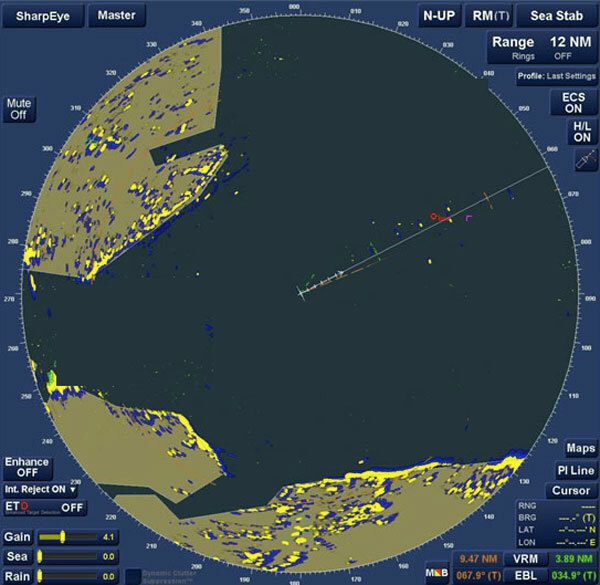 On ECDIS the swinging circle and anchor watch can be set. But not all the ECDIS give the audible alarm if the ship goes out of the swinging circle. Instead, these would just give a visual warning on the ECDIS. By setting the anchor alarm we are making good use of available electronic aids. But if possible, the visual bearing of two objects (or two points on the coast) is the best way to check the anchor position. The two objects or points on the coast must not be on the same (or close to same) bearing lines. The bearings of these two objects must be separated by a significant angle. If available, these two fixed objects must be identified just after anchoring. If possible, the master should discuss the identifiable and conspicuous fixed objects with the duty officer before handing over the command to the duty officer. Once identified, the bearing of these two objects is taken at least once every hour. If there is no significant change in these two bearing, the ship is holding its position. Record the bearings in the anchor log. 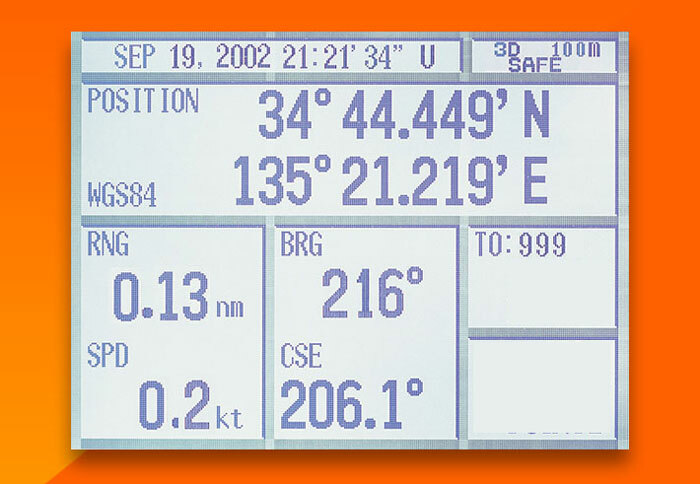 We have discussed so far how to use GPS and Gyro (Visual bearings) to determine if the anchor is dragging. Apart from that, the Radar is very useful equipment for monitoring anchor positions. For using the radar for anchor watch requires radar conspicuous fixed objects. The presence of racon in the vicinity makes it even easier. Straight coast with no edges is not useful for radar bearing. If the radar conspicuous objects (or coast line) is available, bearing and range from this can be measured every hour. Another way that I see navigators make use of is with the EBL and VRM on the radar. We can set the EBL and VRM on the radar and point it to the fixed object that we want to take bearing and range from. 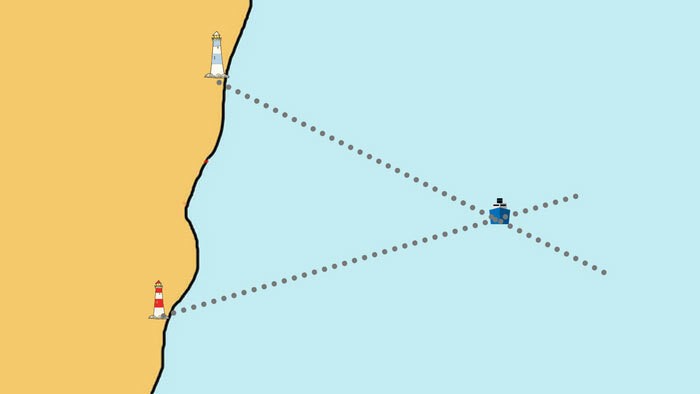 If the EBL and VRM stay right there on the fixed object, the ship has not moved and the anchor is holding. The good thing in this is that each time you have your eyes on the radar screen, you can easily make out in a flash if the ship is maintaining its position or not. Ship’s speed can be a good indicator of the dragging anchor. A ship at anchor or when drifting will always head to the resultant of all the external forces (the wind, current etc). When the ship’s anchor is holding, its speed over ground would be zero and speed through water will be equal to the current of the water. But when the ship’s anchor is dragging, she would be moving with the flow of the current. In this case, ship’s will have some speed over ground but the speed through water will become close to zero. So when the ship is dragging her anchor, she will have the negative speed over ground (GPS speed). So when we are trying to look for an indication of dragging anchor, ship’s speed can be one of the things to keep an eye on. But this will not hold good when the ship is swinging due to change of tide or wind direction. When the ship is swinging, the GPS may show some speed. Faster the ship swings, more speed the GPS will show. 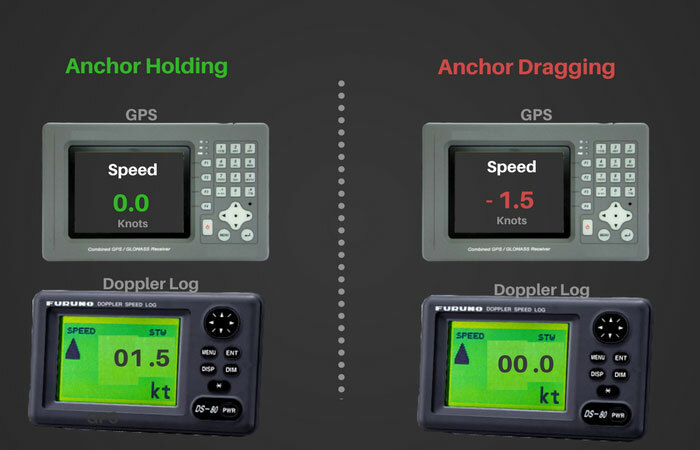 In this case, GPS speed may not be the indicator of dragging anchor. Just wait for the ship to steady its heading and then observe if the ship has some speed. Not all seafarers use the practice of tying up a flag on the anchor chain after anchoring. And it is not a hard and fast rule to do that. Let us understand the role of this flag. There are two things we can do after anchoring. As per the mooring equipment guidelines, both methods have its merits and demerits and anyone of these can be used. I prefer resting the chain on the bar. If we choose to keep the anchor chain clear of the bar, it is good practice to tie a flag to the anchor chain. If the flag falls down, this means the anchor chain has slipped and rested on the bar. This gives the indication that there is a lot of weight on the anchor chain. This could be the first indication that the anchor may drag or is already dragging. Watching the anchor chain in water is another way to know if the anchor is dragging. As the ship is falling back, anchor is expected to hold the ship and stop it from falling back. Ideally as the ship falls back, the anchor would stretch to the maximum capacity. That is, anchor will have the long stay. Now if the anchor is holding and once it is stretched out, it will not allow the ship to fall back and will pull the ship forward. As the ship moves ahead, the weight on the anchor will ease and finally rest at short stay. But if the anchor is dragging, instead of pulling the ship forward the anchor would loose the sea bed and become up and down rapidly. Ship will continue to fall back and anchor will again have the long stay. So if you suspect the anchor is dragging, send someone forward to watch the anchor chain. If the anchor is behaving this way, you can think of that the anchor is dragging. Dragging anchor is not something a watch keeper desires but it is something that may not be in control of the ship staff. The anchor may sometimes drag. Dragging anchor can lead to contact with other ship or grounding of the ship. But all this can be avoided if the watch keeper is alert and knows about the indications of the dragging anchor situation. Early identification is the key to avoid accident related to the dragging anchor situations. Anchor dragging is totally acceptable situation provided it does not lead to an accident. Thank you sir...i love to read your blogs. It gives me lot of energy and knowledge about my profession. Thank you, Bhanu. I feel a lot will change in shipping if we all share what we know. I am just trying my bit. off topic question: Where it is written that it is still allowed to enter in an unsafe atmosphere with a ba set which bottle has lose 10% of the pressure which corresponds with 1200 L( or at least) capacity of compressed air? There are no such written rules... These rules and instructions need to be defined by the company in their SMS. Sir pls explain about dragging circle. Sir pls can u help me to understand better about type of bed for good anchoring ground. As i have read the article Sir you have suggested anchoring in sand area is having more anchoring holding power. But how anchor can hold Sir , if the sea bed is sand and anchor may not hold the sea bed and anchor wil be dragging and shifting its anchor position. Because i heard people saying sand area we should not anchor . pls clarify me sir . Easier the anchor can embed into a surface, easier it will leave the surface. If the anchor is somehow held into the rocky seabed, it will hold the ship strongly but only thing is that it is not easy to for the anchor to fit into the rocky seabed. Moreover, the anchor can get damaged. Mud is easier seabed for the anchor to go in but the anchor will also leave the surface easily. So Mud becomes relatively lesser holding ground. Sand lies in between rock and Mud so is better holding ground. It is no as hard as rock so anchor can easily go in and it is not as soft as Mud so the anchor does not leave the sand seabed so easily. For more information read this. 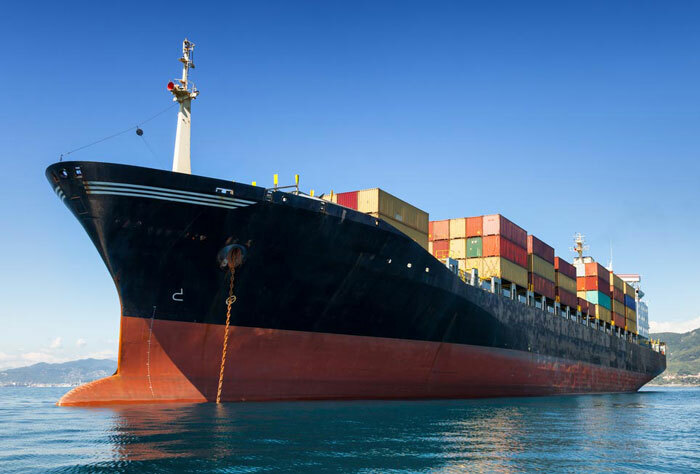 The Ultimate Actionable Guide of Anchoring a Ship. Very well said Sir rajev! Thank you very much,Sir! Your explanation is crystal clear as always. And some very important tips as well. This article is professional and can't easily be forgotten. thanks to you Sir. Dear capt., this question about anchoring is haunting me: should the chain touch the chain stopper? Once a very senior capt. told me the chain should touch the chain stopper, but all other masters told me there should be a gap. I read the OCIMF "anchoring systems and procedures" Page30-41 and from my understanding, the chain should touch the chain stopper. can you shed some light on this question??? I always refer your blog and upgrade my knowledge.Thank you for sharing your knowledge with us captaan Saab.Keep moving. Great sir the subjects you are covering are wonderful and easy to understand and very knowledgeable. Sir please explain how to check with hand lead line that anchor is dragging?? thanks sir for wonderful information. can u plz write about the actions taken for stopping dragging. Sir, why do we use the distance from bridge to forecastle instead of the L.O.A. for computing the swinging circle? Thank you for such wonderful ideas. Your article is really helpful.